BLAIR DENHOLM is a writer and translator who has lived and worked in New York, Moscow, Munich, Abu Dhabi and Australia. His debut crime novel, SOLD, is the first in an Aussie comic-Noir trilogy, featuring the hapless and incorrigible anti-hero, Gary Braswell. Blair has also self-published a kids' book, "Escape from Passing Winds". Gary Braswell does not know how to stop and he keeps getting deeper and deeper into trouble. Fueled by alcohol, Gary is a gambler, and he likes to bet on cricket matches in his home country, Australia. He owes the bookie, Jocko Mackenzie, $4000 and the deadline date is fast approaching. As a successful luxury car salesman at Southport Euro Motors, he finds a way to secure the funds from his boss, Max Buckley. The wealthy Russian couple, Ivan and Irina Romashkin, buy four expensive vehicles (one each for themselves and their two daughters). Gary and his wife, Maddie, have a loving relationship, but his drinking and gambling is causing great strain in the marriage. Although Gary pays off the debt, Jocko has a second stipulation – and this one is dangerous and illegal. 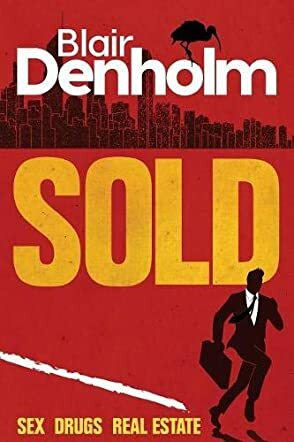 How Gary tries to meet this obligation, while keeping Maddie and himself alive, is the main theme in the gripping novel, Sold, written by Blair Denholm. This fictional work is fast-paced and full of exciting moments. The author introduces many characters throughout the story, and each one is easily imagined in the reader’s mind. The reader is intrigued by Gary’s addictions and how these quickly affect his decision-making. The power that the criminal elements, as well as the alcohol and gambling, have over Gary’s thoughts and actions provide an interesting perspective. Author Blair Denholm engages the reader from the first page to the last in this captivating novel. This book is a definite page-turner, with many twists, turns, and surprises for the reader, including the ending.